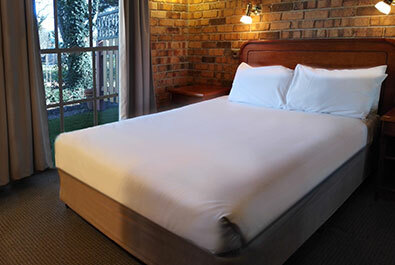 Suites: We have twenty-six comfortable accommodation suites on the property that is naturally graced year-round with a variety of beautiful exotic birds such as Silver Crested Cockatoos, Eastern Rosella parrots, grand pink and grey Galas, and iconic Australian Kookaburras (as featured in our logo). Each has a kitchenette, small fridge, safe, LED flat-screen TV and, of course, fine bath amenities. There’s wireless internet, and climate control air-conditioning. Meals: Great breakfast and lunch meals are available 7 days a week at the Inn’s Cafe Woodworks, directly across the street. Dinner is available on Fridays and Saturdays from the Cafe, and from other establishments in town on other days. Fitness: For exercise, Bungendore Village is a safe and friendly place to go for a slow stroll or a brisk run. Inn guests can also book in to advantage of fitness facilities third-party health and fitness offerings, just a block away. Generous-size room with comfortable Queen bed, a sofa-bed, walk-in shower, kitchenette, high ceilings, and private outdoor garden. Generous-size room with comfortable Queen bed, large bath, and kitchenette. 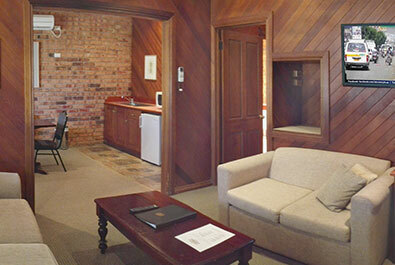 Great business accommodation or a quiet get-away. 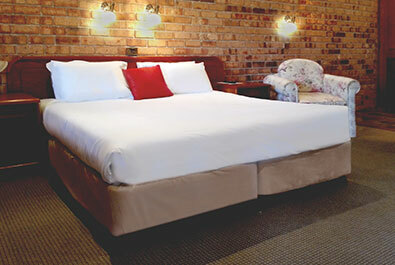 Pleasant 3-room suite with comfortable Queen bed, Jacuzzi spa bath, and lovely amenities. A relaxing retreat from the mundane. Our largest suite with comfortable Queen bed, Jacuzzi spa bath, lovely amenities, and private outdoor garden space. A place for someone special. Comfortable family quarters that can sleep six. Has kitchenette, flat screen TV, bath and toilet facilities, and private garden space. 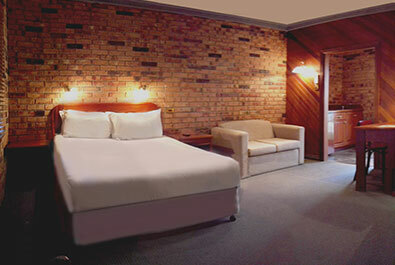 Generous-size room with King or King-Twin beds and wheelchair enabled shower. Positioned for easy access to your car or horse. Makes the layover part of the journey.